Lyricist Yu Aku (1937-2007) wrote many poems about the annual high school baseball tournament held at Hanshin Koshien Stadium. He was especially taken with slugfests, and penned a piece that goes like this: "Those who have been trained possess an almost sublime presence that only they have earned/ There is no need for them to hold back proving it." He continued, "Swung with pure, simple force/ The bat thwacks the ball right at the core with a loud crack/ If the swing is more powerful, the sound is even louder and clearer/ I want to see more of this kind of baseball." Koshien resounded with such sounds during this year's summer high school baseball tournament, which ended Aug. 23. A record total of 68 home runs were hit in 48 games. One player who stood out was Shosei Nakamura, a Koryo High School catcher, who belted six. Every time he swung the bat, cheers rippled through the stands. The third-round game between Kamimura Gakuen and Meiho Senior High School was a veritable hitters' duel. Kamimura, trailing by three runs in the ninth inning, rallied and tied the score. 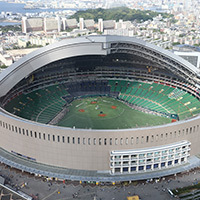 In the 12th inning, it was Meiho's turn to overcome a three-run deficit to win a game in which both teams experienced equal hopes and despair. In the final game, Hanasaki Tokuharu High School's relentless hitting overpowered Koryo. Advances in scientific training and enhanced functions in batting practice machines are some of the reasons cited for the excitingly high level of hitting seen in today's high school baseball competition. But still, each player's daily hard work is at the root of all this excitement. I cannot even imagine the tremendous pressure felt by pitchers facing these formidable batters. Aku expressed his hope in this piece: "Koshien awaits geniuses/ But what Koshien awaits the most is the 'ordinary' enhanced by hard work." High school baseball keeps evolving. Next year, the annual summer tournament will celebrate its 100th anniversary.